You can make a dessert pizza out of all sorts of things, as long as it vaguely follows the standard base + sauce + toppings formula. This time, I used a huge chocolate chip cookie as the base. I used shop-bought cookie dough – I always see that stuff in the shops, and never usually have an excuse to buy it, so I couldn’t resist. Feel free to make your own if you prefer! My ‘sauce’ was actually marshmallow fluff. If you’ve never had this stuff, it’s the most sickly, sticky stuff ever – and it’s amazing. Real marshmallows aren’t usually vegetarian, but marshmallow fluff is, so go crazy. Spread it on thick! As for the toppings for my dessert pizza, I went for crumbled Oreos and some milk and white chocolate. 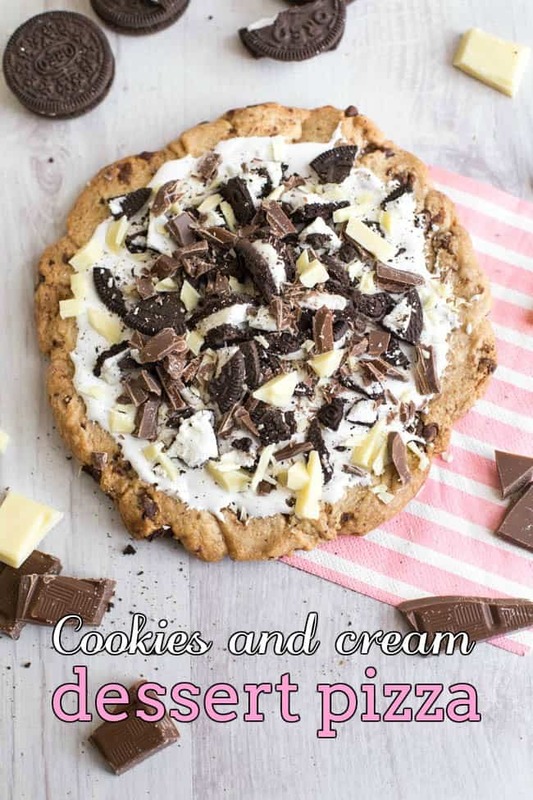 If you’re not bothered about sticking to the ‘cookies and cream’ theme, you could use whatever biscuits, chocolate bars or sweets you fancy – you could even drizzle something delicious over the top. This really isn’t the time to be modest. 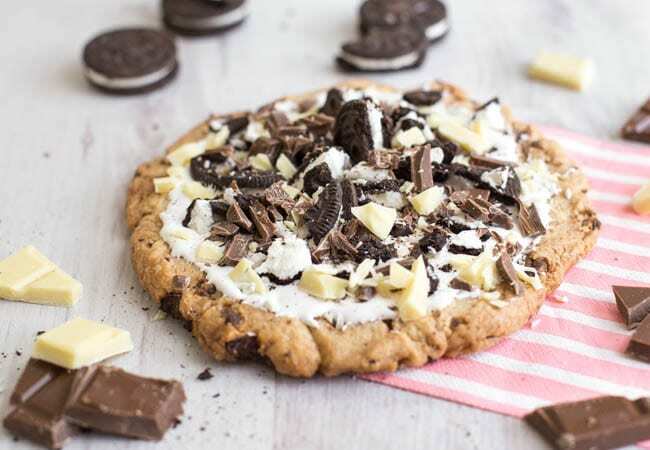 There’s plenty more dessert pizza inspiration over on the Beko website, if you feel like mixing it up a bit. I’m personally drooling over the caramel apple pizza – I enjoy feeling virtuous when there’s fruit in my dessert (never mind all that caramel sauce). 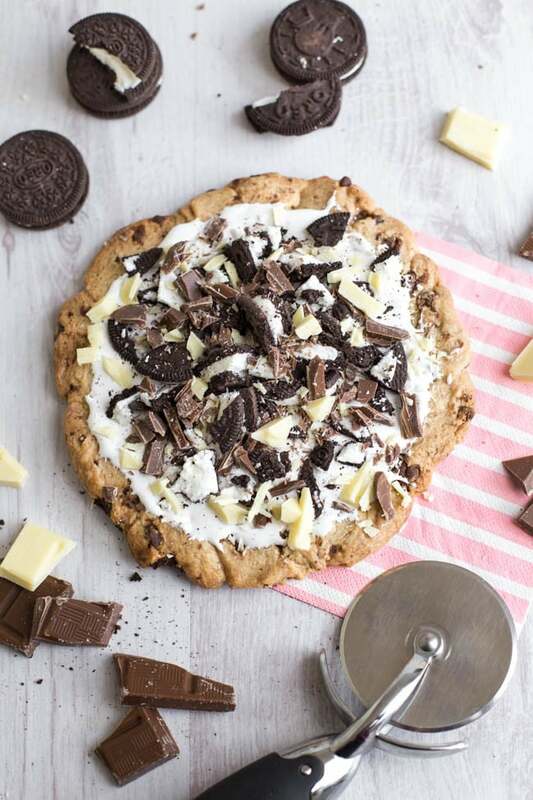 I know a dessert pizza probably isn’t the sort of thing you’d cook for an everyday dinner – this one contains an awful lot of chocolate for a Thursday evening – but I think it would make a great alternative to a birthday cake. To be honest, I can usually take or leave cake (I know, don’t hate me), so I’d be pretty happy with a dessert pizza instead. Especially piled high with Oreos and two kinds of chocolate. What would you put on your dessert pizza? Line a baking tray with non-stick paper, and lightly grease. Cut the cookie dough into chunks, and press it onto the paper to form a rough circle. Bake according to the instructions on the packet - mine took around 10-15 minutes at 190°C (Gas Mark 5 / 375°F). When the cookie is just cooked, set aside. When it has completely cooled, spread it with marshmallow fluff. Roughly chop the Oreos, milk chocolate and white chocolate, and sprinkle over the cookie. My s/daughter brought in a massive oreo cookie cheesecake but it was wasted on me. I don’t like chocolate cake. What an oddball I am! Still, everyone else in my family would devour this in seconds! OMG! My love for a good pizza just got more intense. So going to try this! Oh my gosh! I’ve never seen or heard anything like it! It looks AMAZING! 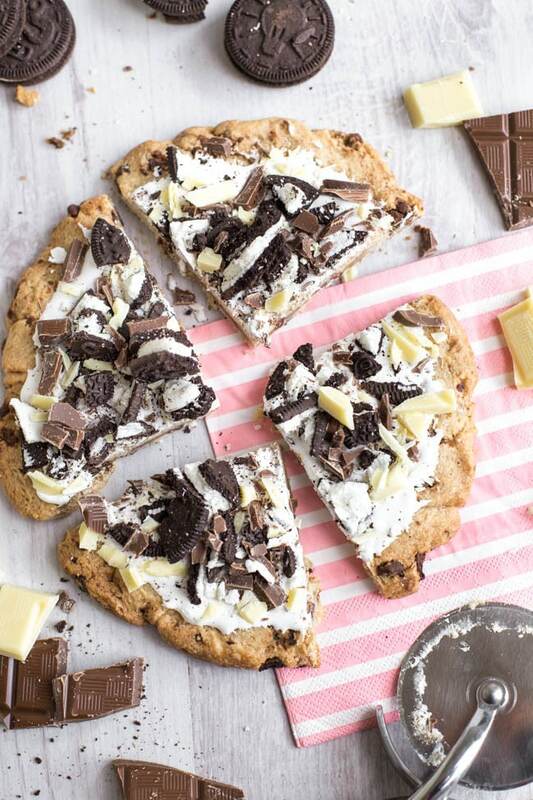 Currently drooling..
OMG desert pizza are you kidding me that looks like the best thing ever! I need it in my life right now! This looks and sounds amazing! I would substitute the Oreo’s for something else though, just because I am not a fan. The rest is right up my street! Oh my gosh this looks like HEAVEN! I don’t think I’d be able to stop if I started though! Oh wow that pizza looks amazing – I can’t imagine anything better than chocolate and pizza! yum! Oh my goodness – this looks incredible! 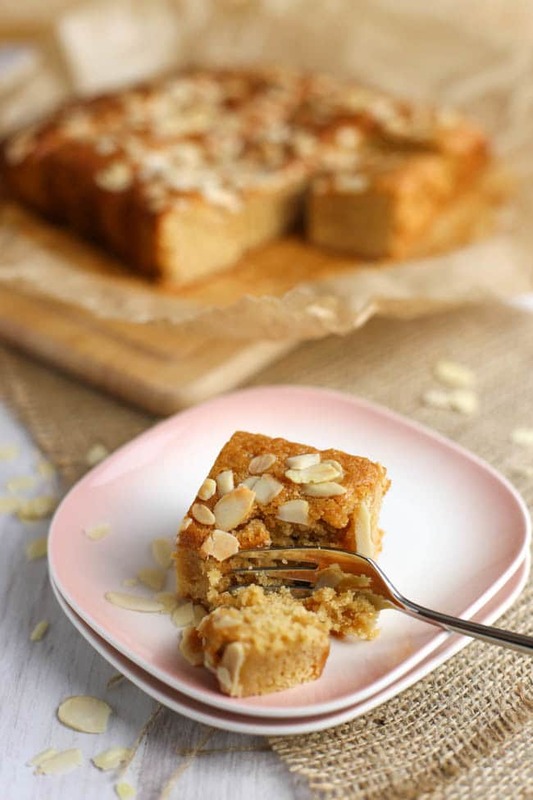 I *have* to make this soon, I know my family would love it! Oh my kids had a chocolate pizza in Camden once and have been going on about it ever since. Will have to give this a try. Haha I’m not sure about not that unhealthy, but thanks! Well doesn’t this just look amazing! 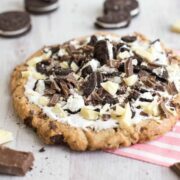 I’ve really fancied trying to make a giant cookie and cut it into wedges like a pizza but with the toppings this one has just gone one further! Love it! This looks epic! I love pizza and cookie dough so this is a match made in heaven! I made a nutella and banana pizza lately which was sooooo good! Oh this looks so good. I want a slice! This is such a good idea! That looks fantastic, I wish i had all the ingredients as i’d make it now. I love a swizza (as I call it!) and have been known to make one or two in my time. Love the cookie crust! Ooh swizza! I like it. Oh my God! That looks amazing! I want it! Dominos need to start offering this as a dessert option! Have you tried the Dominos chocolate cookies?! SO GOOD! WOW that looks amazing!!! My kids would go crazy for that, as would I, maybe I will give it a go on the next special occasion!! Hah – definitely not a time to be modest LOL!! Love this idea – it would be great for a kids’ party too! I was thinking the same thing. My 5 year old has a birthday coming up too! OH My goodness. I will HAVE to do this and I know a friend who will also go gaga for it so will make sure to show her. Thanks! This pizza looks so good. I will try this recipe. A dessert cookies and cream pizza? Now that sounds like heaven! I don’t have a sweet tooth but this is something I would love to try. My husband and daughter will love it! OMG that looks amazing! I must give this a go next time my friends come round! I bet we’d all love it!